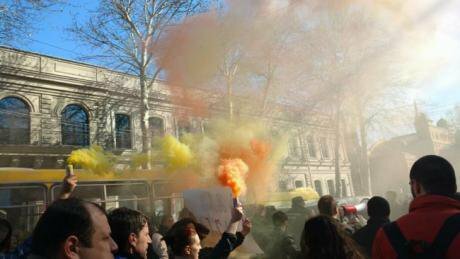 Protests in the city of Rustavi, western Georgia, against layoffs at the nearby Azoti plant, 1 February. At the beginning of this month, the Georgian Public Broadcaster announced a plan to reorganise itself; the plan was consumer-oriented and would mean cuts in the broadcaster’s staff. Job cuts have also been announced in a number of other public sector institutions. On top of this, the government is displaying complete apathy towards ill-treatment and forceful dismissals of employees in the private sector. To present itself at the vanguard of creating a “business-friendly environment”, the Georgian government sees no problem with soaring unemployment rates or causing employment to be even more conducive to labour exploitation. But for the people currently demonstrating on the streets, it is unacceptable that plans for growth and development come at the expense of public sector employment and workers’ rights. In 1989, the public sector accounted for the lion’s share of total employment in the Soviet Union, exceeding 90% in some republics. The shift to a market economy resulted in a radical change in the employment structure in all post-Soviet republics. But the percentage of Georgia’s workforce employed in the public sector has continued to fall long after this transition, from 20% to 15% in the last decade. To avoid public discontent from this, the previous ruling party often responded by announcing impressive economic growth figures, neglecting the fact that this rapid growth has not been accompanied by a reduction in poverty or a tangible decrease in unemployment. What is more, due to low levels of formal employment, successive governments have neglected that the private sector is extremely conducive to the exploitation of workers, underemployment, low pay, and dangerous labour conditions. Members of the OECD, a developed countries’ club, have an average public sector employment rate of 21%, which not only guarantees strong and effective government institutions, but also allows states to moderate the excesses of the markets. 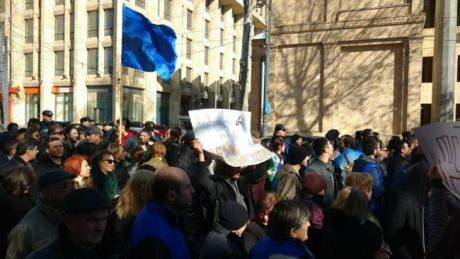 Cutting public sector jobs was not the most convincing development plan for the protesters gathered in front of the Georgian Public Broadcaster on 9 February, as it represented the commodification of yet another public good, while imperilling the job security of many. The people demonstrating on the streets are very conscious that the government, politicians, and sometimes even the mainstream media, are guilty. Guilty of wrongly juxtaposing jobless economic growth and welfare, and for imposing a choice between the two. Worst of all, the government is evading its responsibility to reduce unemployment, to combat deteriorating living standards for those who are employed, and is choosing a very exclusionary path to economic development instead. Labour protests on Tbilisi’s Rustaveli Avenue, 7 February. Over the past few months, the state has dismissed thousands of public employees. On 30 January, it was announced that the Ministry of Defence alone was firing 2,250 employees. This was followed by news that the Georgian Public Broadcaster is employing an unnecessarily high number of people. Additionally, rumours are circulating that some of the 13,000 public sector jobs at Georgian Railway are under threat. The bottom line is that in an attempt to foster economic development, new political decisions are being made to shrink the public sector. This represents a very detrimental turn for those who believed the government would follow its Georgia 2020 development strategy of ensuring inclusive growth and developing human capital. In 2013–2015, the government introduced amendments to Georgia’s labour code and developed guarantees to advance workers’ protection in the country. For example, workplace inspections for occupational health and safety violations reemerged, after being totally abolished in 2006 under the previous ruling party. A labour dispute mediation mechanism was set up, as well as “tripartite negotiation formats”, which allow the authorities, employees, and employers, to engage in dialogue. Additionally, independent workers’ organisations have emerged, to defend labour rights within the most hazardous employment sectors. Even though the current government has set up new welfare mechanisms, the overall development trajectory hasn’t changed much. The state still provides inadequate social guarantees and does not listen to demands by grassroots protesters, which have been visible and vocal since 2012 compared to previous periods. For several days, news that the public sector would be shrinking further has been paralleled by videos spreading on social media in which young employees from several stores (the supermarket chain Fresco and bookstore chain Biblus) talk about the grave labour conditions, poor pay, and ill-treatment from employers that they face. In response, the Minister of Labour, Health, and Social Affairs reduced the protests to being single cases of labour disputes between particular employees and employers, denying the importance or necessity of a government response. 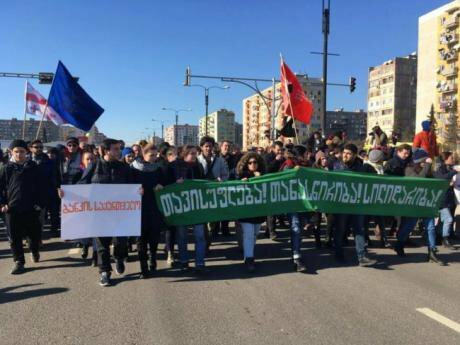 What’s worse, the government has not commented on the dismissal of 350 employees from the Rustavi Azoti plant, even when on 2 February, a day after the dismissals, protesting workers, students, and trade unions invaded the company’s administration building. For over 10 days people were demonstrating on the streets of either Rustavi or Tbilisi on a daily basis, demanding state intervention. While many on the right of the political divide argue that a bigger and more capable state will only breed corruption, they fail to acknowledge that their argument, equating regulations with corruption, is political in nature. In reality, defending labour conditions does not necessarily come at the expense of good governance. In Soviet times, trade unions were not trusted, as they were seen as a tentacle of the party. Since then, as industrial production fell, agriculture became a field fully occupied by self-employed smallholder farmers, and the service sector did not develop enough for any prospects for unionisation, unions have remained weak. What’s more, it is of the absolute disdain to anyone currently fighting for labour rights that the majority of industrial companies still have functioning ‘yellow trade unions’, which are controlled by the the companies themselves and are never loyal to workers’ interests. Despite the weakness of the unions, for the crowd gathered on the streets, it has become clear that it is necessary to persist with organised resistance against major employers and become more and more vocal in demands for a bigger and more capable state. Since 2005, transportation, industrial production, and natural resource extraction enterprises have been revitalised in the country, and service jobs are becoming more prevalent. It is therefore rather alarming that the government remains inactive while employers violate domestic law, attack workers’ unions, and use oppressive methods to crush protests. If the government also attempts to shrink the public sector further, employment will become more conducive to exploitation than ever before.